Yesterday we reported on the huge news of Russia’s government ratifying the BRICS Development Bank and suggested that the West would seek to respond in some way. That response emerged just hours later. Moody’s, the same ratings agency that failed to see the 07/08 crisis coming by rating toxic assets as AAA, has put Russia’s debt into the ‘Junk‘ zone. The agency cites an ‘expected’ continuing depression in Russia, suggesting a ‘decline in confidence’ in the country means growth will not be possible. We would suggest Moody’s pay closer attention to this very website – 21st Century Wire – where we have complied a mass of coverage pointing to the contrary of Moody’s allegations. Russia is anything but isolated and many countries have very high confidence in the nation. The Iranians recently signed a defence agreement with Russia, while the Chinese have been coordinating with the Russians to tackle the proposed American missile shield. China and Russia have also been expanding their already astronomical energy dealings. The Egyptians, also, have incredibly high levels of confidence in Russia, allowing them to develop an entire nuclear industry throughout the developing nation. Yesterday’s announcement of the Russian ratification of the $100Billion BRICS Development Bank was the culmination of these mass of deals Russia has been involved with. When anti-Austerity, anti-IMF and anti-Oligarchy party Syriza came to power in Greece, the entire country was painted as a hub for terrorism the very next day. Belarus and France have also now begun to show similar tendencies as Syriza. A highly questionable component of global finance. Moody’s attempt to paint Russian debt as ‘Junk’ is yet another obvious propaganda stunt aimed at continuing the current demonization campaign against the country. Anybody who would trust the ratings of an agency that framed toxic assets as ‘AAA’ rated should have both their character, and intentions, questioned. This is not the first incident where Moody’s has weaponized, geopolitically speaking, its dubious rating system to advance US foreign policy interests. 21WIRE reported back in June 2013, when Hong Kong authorities would not honor U.S. requests to arrest and handover the fugitive Edward Snowden, only to discover that Moody’s had downgraded 9 major Hong Kong banks the following day. Look to 21st Century Wire next week for a more in-depth look, from myself, on what Russia’s increasing involvement in world affairs and the BRICS Development Bank really means for the international system. 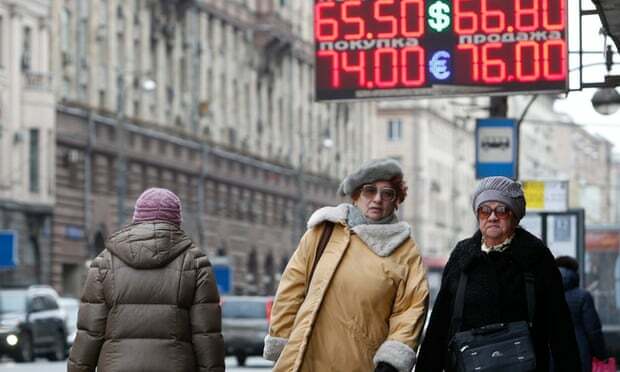 Moody’s has cut Russia’s debt rating by one notch into “junk” territory, saying the Ukraine crisis and the fall in oil prices and plunging rouble would further undermine Russia’s economy. Just over one month since its last downgrade of Moscow’s credit rating, Moody’s said Russia “is expected to experience a deep recession in 2015 and a continued contraction in 2016.